operations during manual cargo moving. At present the only assessment is provided by a large series of studies summarized by Snook and Ciriello: for each measured pulling and/or pushing operation, the limit values of applied force are shown both at the initial moment and during the keeping phase. 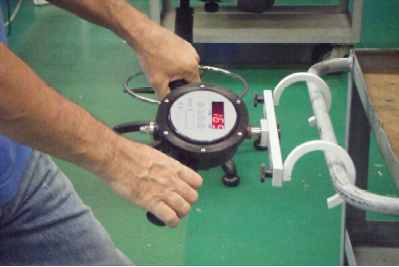 The quantity of applied forces requires the use of appropriate of measurement tools (DYNAMOMETERS) which have to be used IN THE ACTUAL OPERATING CONDITIONS. 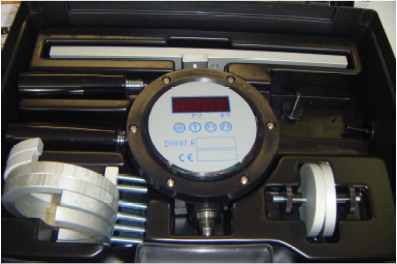 The use of a dynamometer is therefore essential to calculate the “exposure indexes” as the above-mentioned document suggests. The DIN96E DYNAMOMETER, because of the hook varieties (refer to the technical specifications) it has and the handle ergonomic location, it can measure stresses in the actual operating conditions. · Assessment of pulling/pushing operations of carriages, transpallets, etc. in industrial area (on different types of slopes and grounds). · Assessment of pulling/pushing operations of instruments fitted with wheels. · Dynamometers can also be used to measure the stress during hoisting operations. 5. Ergonomic handle coplanar with the forces to be measured. 7. Measure with the possibility to hook the load in a single point (by using only the sleigh) or in two points 6 or 28 cm away (also using the hook-holding bar). 8. Manual assembling and disassembling (without any tool) of the bar and the various connections. dimensions: 36x 26 x 12 cm. 10. Connections supplied: two plates and two “forks” for pushing operations; two hooks and two closed rings with self-blocking clamps for pulling operations. SNOOK AND CIRIELLO REFERENCE WORK TABLES (LIMIT VALUES) ARE ALSO SUPPLIED.